At some point Funko will run out of things to pop, but until then we can enjoy the disproportionate head-to-body ratio of Destiny's finest. 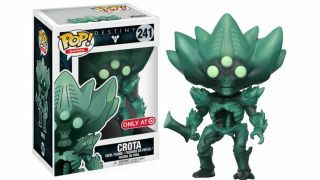 There are eight figures in all, including two versions of Crota with a limited edition glowing option to keep you company at night. All in all, Cayde-6, Ikora and Zavala are represented, along with Oryx, Xur and Atheon. So both all shades of light, dark and somewhere in-between will get some bobbley headed representation. You'll have to wait a while though, as the range isn't releasing until September 8 this year. In the mean time, why not check out everything we know about the upcoming Destiny 2, or check out the best Destiny 2 pre-order deals if you're already sold on the game.